Wild Yam is a root vegetable used in Asian cooking, where it is added to noodles and soups, or eaten as a side dish. It contains vitamins, minerals, fibre, carbohydrate and protein. Wild Yam is a good source of plant sterols, which are thought to contribute to Asian women’s good health, especially around the time of the menopause. An Advanced Nutrition Complex multivitamin is also recommended. 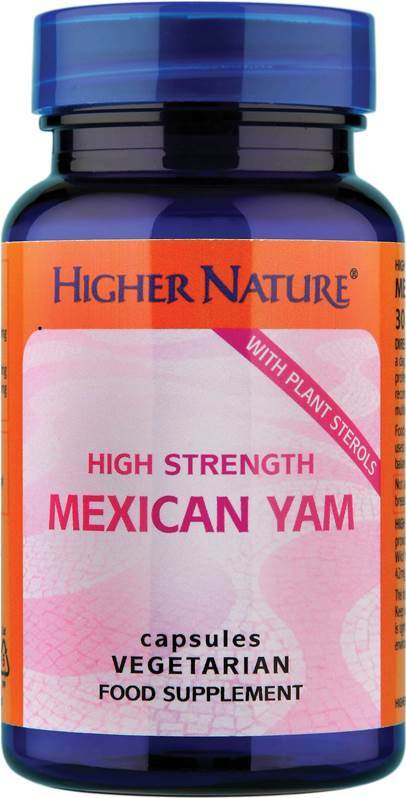 These super strength Mexican yam capsules provide a rich source of natural plant sterols from the highest quality Mexican wild yam extracts, with a guaranteed 42.5mg diosgenin per capsule. Mexican yam is an adaptogen that helps the adrenal glands adapt to changes in the body. It contains diosgenin which may be a helpful support to the body during menopause when female hormones are low. Mexican yam helps to relax smooth muscles, such as that found lining the uterus and may be of benefit around the time of menstruation. 150mg Mexican Wild Yam (Dioscorea villosa) standardised extract (7% diosgenin) , 200mg Wild Yam (Dioscorea opposita) standardised extract (16% diosgenin), 42.5mg Total Diosgenin. - No added: Sugar, salt, wheat, gluten, maize/corn, yeast, lactose, dairy products, artificial preservatives, colours or flavourings. - Vegetarian and vegan. - Not advisable if pregnant or breastfeeding. Rice bran, Hydroxypropyl methylcellulose (carrageenan). Take 1-2 capsules a day, with meals. A daily multivitamin is also recommended. Sugar, salt, wheat, gluten, maize/corn, yeast, lactose, dairy products, artificial preservatives, colours or flavourings.